THE HOUSTON STORY, 1955. Original 1 Sheet (27 x 41” / 69 x 104 cm) folded Movie Poster starring Gene Barry, Barbara Hale and Edward Arnold and directed by William Castle. 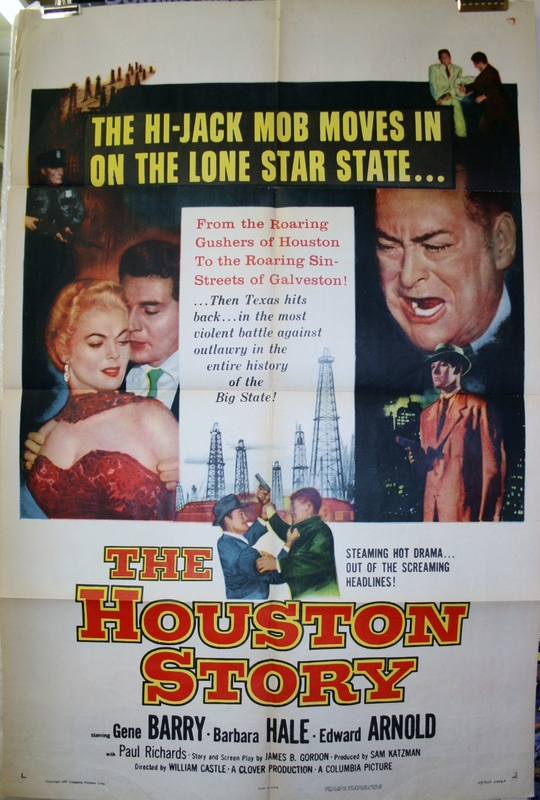 The Houston Story is a Film Noir crime movie that relates the story of a Galveston driller who decides to steal oil and build his fortune with the help of a Houston mobster and financier. “The Hi-Jack mob movies in on the Lone Star State”. “From the roaring gushers of Houston to the roaring in-streets of Galveston”. This folded poster is in very good original C8 condition, but does have some minor wear and wrinkling along the margin edges. This classic poster would look great once linen backed! This process is an additional $80 upon request or by adding the service to your cart below. This would produce a flat, backed poster that’s ready to display! Want to frame this poster as well? We also offer many varieties of framing options for our customers to choose from! We linen back and frame all of our posters IN HOUSE at our studio in Katy, TX!